Nzuri is a Swahili word that means "very good." When we set out to create a product for hair, skin and nails, our team of experts knew we needed to produce a product that was excellent. Just like the meaning of the name, Nzuri is very good for growing longer, stronger, healthier hair and it's very good for your health. What causes hair to grow or not to grow? Healthy hair is not only a pleasure to behold; it is pleasing to the person that has it. A single follicle on the human scalp produces approximately .35 millimeters of hair shaft per day. The cycles of growth of each follicle consist of the building up and tearing down of the structure. After a period of rest the follicle is built anew from raw materials and each hair follicle goes through this identical process as it grows longer and stronger. 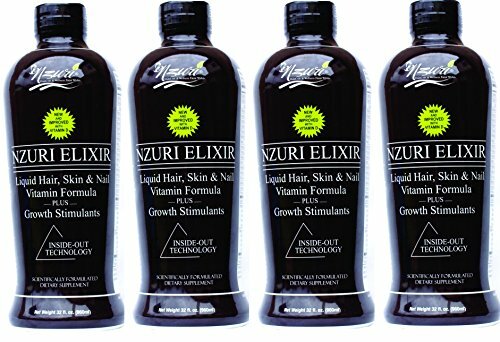 Nzuri, a high-quality liquid multivitamin hair tonic supplies the body with the proper vitamins, amino acids, and minerals that you may not be receiving in your diet to help create beautiful, healthy hair. It is important to point out that many of the metabolic requirements of the cells of the hair follicle must be met or adequate and optimal hair growth will not occur. This means that certain vitamins and minerals must be present in adequate proportions or there will be faulty or nonexistent hair growth. Research has shown that in our hurry up world of fast food, and extreme work schedules we have developed extraordinarily poor eating habits. This extremely poor diet affecting our general health and energy levels and makes our fingernails weaker and our hair thinner and far less healthier. If you have any questions about this product by NZURI, contact us by completing and submitting the form below. If you are looking for a specif part number, please include it with your message.